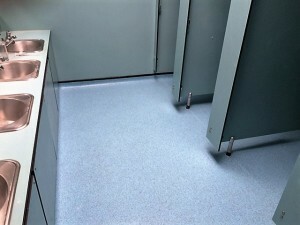 Flooring used – Polyflor Polysafe Standard PUR Cool Aqua. Schools are busy places – children spend approx 635 hours per school year in the classroom. There’s a risk of spills or wetness, as lots of children using the bathrooms daily. Safety flooring was chosen to reduce the risk of slips an falls. I’ts slip resistance and durability make it the perfect choice. By coving the flooring up the wall this has provided a floor that looks good and is easy to clean. Polyflor Polysafe Standard PUR is popular safety vinyl range. It combine slip resistance with durability for years of performance. It’s suitable for heavy traffic areas – such as washrooms, W.C.’s, classrooms and kitchens. Polysafe Standard PUR is available in 16 colours, the range incorporates safety aggregates in the vinyl to create a safe yet attractive looking floor. Polysafe Ultima is 100% recyclable and contains recycled material. Eastcroft Depot London Road Nottingham. Polysafe Ultima was the clear flooring choice due to its enhanced slip resistance and proven use within busy areas. This depot provides maintenance workers & refuse collectors with canteen, locker and shower facilities. Part one of this project was to fit none slip flooring to the stairs and corridors – this building has a heavy footfall of workers who may have been working outdoors in all conditions. Polysafe Ultima offers the perfect solution with sustainable slip resistance to help provide underfoot safety, making this the ideal floor covering for this working space. Fully compliant with Health and Safety Executive (HSE) Guidelines, this flexible floor covering can be coved and welded – Seam welding achieves an impervious and hygienic finish and Ultima’s slip resistance is assured throughout the guaranteed life of the product with a simple maintenance regime. The Polysafe Hydro and Hydro Evolve flooring ranges are specially designed with a raised profile and are suitable for barefoot and continually wet areas such as walk-in showers, changing room facilities, bathrooms and indoor swimming pool surrounds. Polysafe hydro is used in major use areas such as healthcare & education: available in 8 aqueous colours. Polysafe Hydro Evolve is a clear decorative safety floor with multi-coloured chips and co-ordinating aggregates for sustainable slip resistance: available in 8 light subtle colours. For more information on Polysafe Hydro and Hydro Evolve Contact Us. Polysafe Modena PUR, this is Polyflor’s newest high clarity vinyl safety flooring – bringing interior design schemes to life. Polysafe Modena PUR feature a unique, micro-granite decoration with ‘invisible’ safety aggregates, it’s sophisticated and subtle accent hues create a welcoming yet safe feel to commercial, institutional or residential areas. To the naked eye, Modena PUR looks like a decorative smooth vinyl – the slip resistant particles provide a fully fledged safety floor with slip resistance assured throughout the guaranteed life of the product. 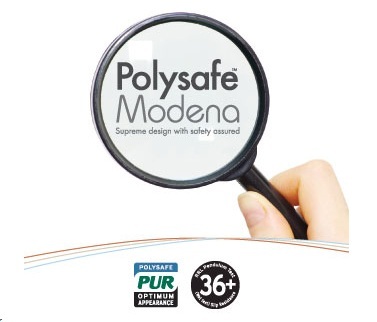 Polysafe PUR reinforcement ensures Modena can look spotless day in, day out, providing durable & superior cleaning benefits. There are many performance requirements for health care flooring. 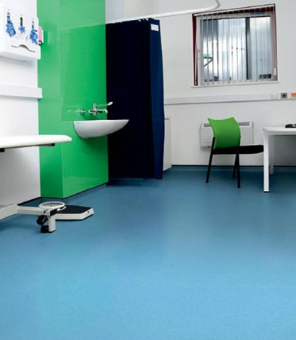 Polyflor offer an extensive range of floor coverings to meet the multiple needs of healthcare. Infection control is the pivotal concern for the healthcare sector ensuring floorcoverings are hygienic, safe, practical and fit for purpose. For high risk area’s a continuous, impervious floorcovering that offers no sanctuary for bacteria or dirt is required. This can be achieved by using sheet vinyl that can be welded including external and internal joints when the vinyl is cove formed. Cove formers and capping strips offer a clean solution for the junction where the floor meets the wall making cleaning more effective. Polyflor Pearlazzo PUR – high performance, heavy duty, Lifetime polish free maintenance regime and contemporary colourways. Polyflor Forest fx PUR – Developed from authentic reproductions of popular wood designs, developed for very heavy commercial installations and features polyurethane reinforcement (PUR) for improved cleaning and maintenance and features polyurethane reinforcement (PUR) for improved cleaning and maintenance. Polysafe Standard PUR – Reinforced with Polysafe PUR for optimum appearance retention with slip resistance assured throughout the guaranteed life of the product. Camaro Flooring has been developed to offer a collection of creative, authentic and practical floorcoverings to enhance any home interior. The Camaro Stone Flooring Collection offers the natural beauty of stone, replicating the colours, patterns and textures perfectly suited for Classic or contemporary interiors. Classic Limestone provides a presents charm & beauty, whilst the highly decorative Oilshale provides a modern finish which is easy to maintain. Camaro has been designed to reflect the natural beauty of wood, encompassing detailed and accurate timber variation, grain and knots. The planks vary in size and texture to enhance the natural appearance.From blond Ambrosia Maple to Heritage Oak – Camaro wood flooring shows the strong character of the wood, replicating natural graining and patina. The extraordinary detail of Camaro flooring will enhance any room in your home, whilst giving you the benefit of a practical & durable floor covering. Polyflor Acoustic floorcoverings are specifically designed for both residential and commercial areas where sound insulation is required. Such areas may include apartment blocks, educational and healthcare facilities and general public buildings. Acoustic floorcoverings effectively assist in reducing the intensity of sound waves generated within the structure of a building, dampening impact sound levels at source. Polyflor offer a number of Acoustic floorcoverings all featuring polyurethane reinforcement (PUR) that provides a polish-free maintenance regime. Expona Design Polyflor Flooring Section. The latest section of flooring to be Added to Mark Tulley Flooring range is Expona. Expona Design has a wide collection of authentic wood designs from classic to contemporary effects and authentic stone, slate, metallic and abstract tile, with realistic surface textures which are suitable for use within all very heavy commercial and residential situations. Ideal for bathroom floors, utility rooms, hallways, dining rooms and kitchens. If you don’t see something on the website you would like please contact Mark.